Back again for day eight of the Blogtember Challenge, the fabulous and fun link up organized and hosted by Bailey Jean of Brave Love Blog. Blogtember encourages bloggers to post every day for a whole month using prompts supplied by Bailey Jean, which you can find here. Our most recent project was to work on the tiny entryway/mudroom, which Hubby painted and we re-organized, removing the storage cubbies which had been there and replacing them with a small ottoman. We're using the ottoman as a somewhere to sit while putting on or removing shoes and also as a place to store our re-usable shopping bags. The door straight ahead leads into our little hallway and through that to the rest of the house. Under the mirror is an Ikea Trones unit. One of a set of three. They're supposed to be used to store shoes in but they're such wonderfully slim units that they fit everywhere and have so, so many uses. This one has my folding walking canes and umbrellas. Sitting on top of the Trones unit is a solar powered fairy home :) This will eventually move out into the garden, probably next year now, but I bought it to become part of a fairy garden :) It looks so lovely glowing warmly in the darkness. The rail under the door of the cupboard (where the electricity meter lives) has tubs holding useful items ready to be grabbed on the way out the door such as Jade's baggies for walkies, packets of tissues and small bottles of hand sanitizer. Above the Ikea Trones units (on the wall) is a small cubby unit holding baskets with hats, scarves & gloves while the top of the Trones units themselves is home to the cutest ceramic container I fell in love with on sight, a (double sided) frame with photos of our furbaby, a pink glass heart and a crystal cube which, if you hold it up to the light you'l see a bouquet of flowers. It was a gift from Hubby a long, long time ago . If you'd like to see the rest of the entryway/mudroom you can see more photos here including the extra storage and how (I hope) I've managed to stop a little of the leaves and assorted dirt from outside making it past our little entryway. Hubby installed a worktop and base unit (along with the best little pull out trolley ever!) 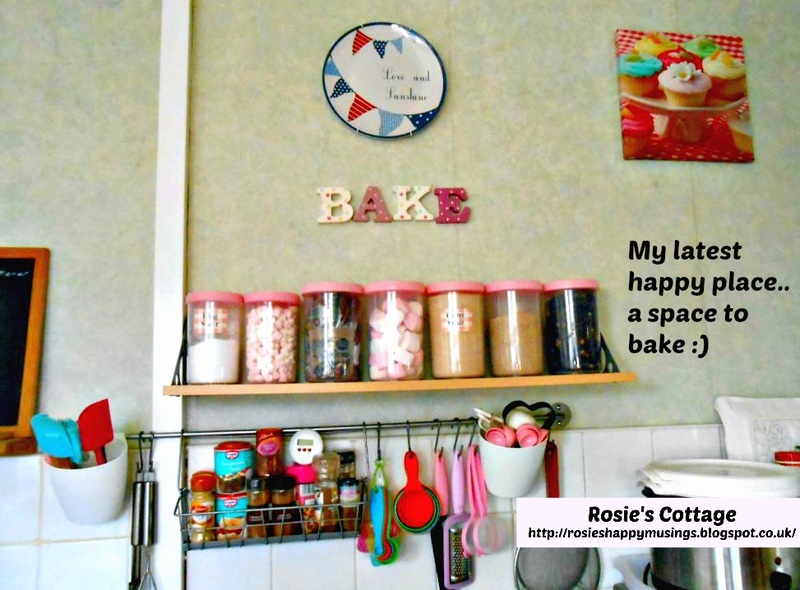 for me and now I have my own little piece of heaven.. a baking area! If you'd like to see more of the kitchen honeys, you can see our makeover here, there are details about the adorable (and oh-so-useful) trolley here and there is even a tour of the kitchen walls, and their organizing accessories here. You might notice my desk has the pull out tray once designed to hold a keyboard and mouse when we all had desktop computers? Since I use a laptop obviously this wasn't needed but it seemed like such a waste of what might be useful space. I'm still using this system and it's a fabulous way to keep useful things such as pens, pencils etc all close to hand. You can find the details in this post honeys. I can't wait to read everyone's posts today. I'm running a little late with this one, I'm afraid. I've been doing so well till now by scheduling a few posts but today got away from me because I also had a post to publish in the Picture Perfect Project link up too. Till tomorrow then dear ones, thank you so much for visiting, smile lots and hug even more! It's neat to see other peoples spaces. I adore the elephant near your computer.